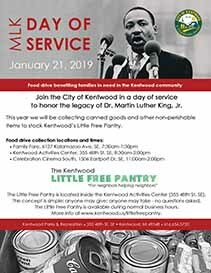 Join the City of Kentwood in a day of service to honor the legacy of Dr. Martin Luther King, Jr. This year we will be collecting canned goods and other non-perishable items to stock Kentwood’s Little Free Pantry. The Little Free Pantry began as a community service project for MLK Day in 2017. Located inside the Kentwood Activities Center (355 48th St. SE), it helps a number of Kentwood families in need. The concept is simple: anyone may give; anyone may take - no questions asked. The Little Free Pantry is available during normal business hours: 8:30am-5:30pm Mon-Thur, 8:00am-4:00pm on Fridays. Learn more at www.kentwood.us/littlefreepantry.